I made this up just for Vaughnde. She was asking for the recipe in the chat. I have also added pretzels for twigs and flowers that I made from gumdrops. It really is a fun recipe that you can make with your kids or grandkids. Cute card, love how "dirty" it looks. This is Fabulous Sara! Thanks for sharing the recipe! Darling card Sara. I really like the grunge and how you used the flowers. Looks fantastic! 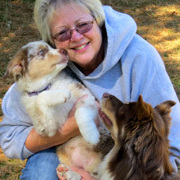 This one is way cute too! I'm so excited to add them to my collection!! Very cute card - so appropriate for "Dirt" cake!! **idea** I have served this in a clean, new flowerpot! Makes a great centerpiece!! 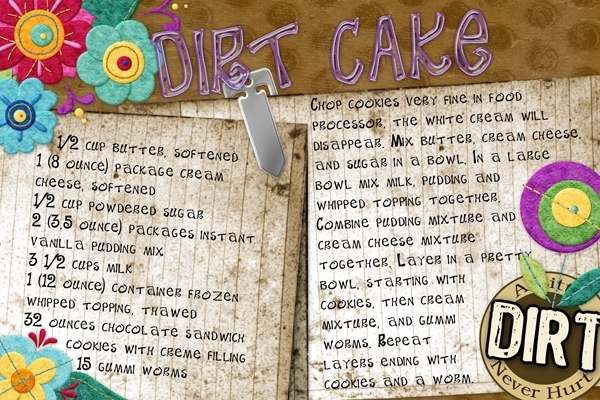 Oooooo I love this recipe, and your dirt word art is perfect. Was waiting to see some gummy worms come slithering out of your layout. Love the bright colors of the flowers that make me think of sourpatch gummy worm colors. The title with the acrylic style in purple is terrific! LOVE it! LOVE it! LOVE it! Love the flowers and the title. I really love the font - cute and so easy to read. TFS!